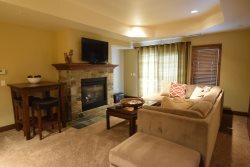 Updated 2 Bedroom 2 Bath Beach level Condo with Beautiful views of Payette Lake and Mountains. Master bedroom has a Queen size bed and Bedroom 2 has a Full size bed along with Sleeper sofa in living room for a total of 3 beds. Flat Screen TV with Cable & DVD Player. Nice enclosed patio. BBQ'S near pool area for guest use. Unit does not have air conditioning. Unit is located in the lower level. Access to Pool in Summer. Beach Front & Beach Access. No Dock Access. No Trailers allowed in parking area. 1. Renters must register with the Crystal Beach Managers prior to or upon occupancy. 2. No more than 6 persons per 2 bedroom unit and 8 per 3 bedroom unit. 3. Renters and their guests may not have pets of any kind on the Association property. 4. Renters guests (people other than those listed on the registration form) may not use the common area facilities including, but not limited to, the pool area, beach or docks. 5. Renters may not store their boat or watercraft in any of the moorage slips or dock spaces unless a slip is specifically assigned to the unit being rented. Overnight moorage facilities are available at Mile High Marina (634-8605). 6. Pool hours are from 10:00 AM to 10:00 PM. No glass in the pool enclosure. The Pool gates are to be closed and locked at all times. Do not remove patio furniture from the pool area. 7. No open fires on the beaches. No flame barbequing within 15 feet of the building. This restriction applies to halls, stair landings and covered patios. PLEASE BE MINDFUL OF PREVAILING WINDS. 8. Quite time is between 10:00 PM and 9:00 Am. As a courtesy to other owners please be mindful of noise levels during these hours. 9. Trailers, RV’s, campers, or commercial vehicles are not allowed to be parked in the parking lot. Long term trailer storage is available through Mile High Marina (634-8605) or 72 hour parking is available at the city trailer lot close to the boat ramp by Mile High Marina. 10. No storage of items in the common areas of the condominium property, including but not limited to the enclaves between patios on the ground floor. 11. No swimming suits, wet suits, life jackets, towels, or any other items are to be draped over the railings. 12. No storage of boats, jet skis or personal watercraft, swimming equipment, toys or other items on the beach. A limited number of storage buoys for personal watercraft is available through Crystal Beach management or offsite storage is available through Mile High Marina (634-8605).